Derek Parfit was one of the world’s leading philosophers. His On What Matters was the most eagerly awaited book in philosophy for many years. 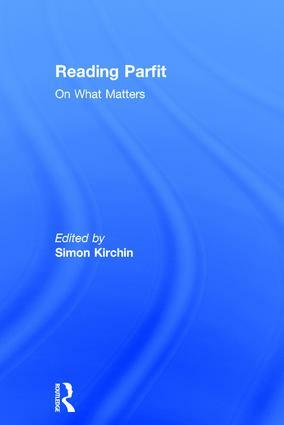 Reading Parfit: On What Matters is an essential overview and assessment of volumes 1 and 2 of Parfit’s monumental work by a team of international contributors, and includes responses by Parfit himself. It discusses central features of Parfit’s book, including the structure and nature of reasons; the ideas underlying moral principles; Parfit’s discussions of consequentialism, contractualism and Kantian deontology; and his metaethical ideas and arguments. Reading Parfit will be central reading for students of ethics and anyone seeking a deeper understanding of one of the most important works of philosophy published in the last fifty years. Derek Parfit was one of the world’s leading philosophers. His On What Matters is the most eagerly-awaited book in philosophy for many years and heralded by Peter Singer in the Times Literary Supplement as "the most significant work in ethics since Sidgwick’s masterpiece, The Methods of Ethics, was published in 1873." Contributors: David Copp, J.L. Dowell and David Sobel, Julia Driver, Simon Kirchin, David McNaughton and Piers Rawling, Julia Markovits, Derek Parfit, Douglas W. Portmore, Kieran Setiya and Philip Stratton-Lake. Simon Kirchin is Reader in Philosophy at the University of Kent. He is the author of Metaethics (2012) and is the editor of Arguing about Metaethics (with Andrew Fisher) (Routledge, 2006). Derek Parfit (1942–2017) was for many years a Fellow of All Souls College, Oxford, retiring as Senior Research Fellow in 2010, whereupon he became an Emeritus Fellow. He also held visiting professorships at New York University, Harvard and Rutgers. For more information about this book, read our exclusive interview with Simon Kirchin to find out why Derek Parfit was such an influential philosopher, as well as discussion of Parfit's theories including Contractualism and 'Triple Theory'.